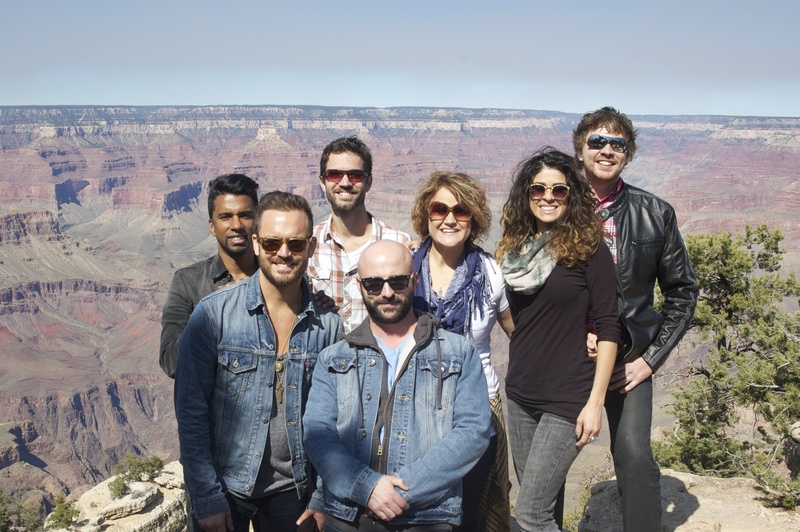 Fuzed Worship had an amazing opportunity to go to the Grand Canyon last week while we were playing an event in Arizona. Wow! We were so thankful we got to see one of the Seven Wonders of the World. It was beautiful – so many different layers and colors to see. It was as if no matter how much we looked at it, we couldn’t take it all in. Our cameras just wouldn’t do it justice. The iris just couldn’t capture it. Beauty as far as the eye could see. And this is just one small facet of the amazing universe that God created. I couldn’t help but think of the glory and majesty of God and how you and I are caught up in it. Scientists think it was created by some kind of water and wind erosion; but no matter how God chose to create it…He deserves all the glory. Everything was created for His glory – all of the earth, every star and galaxy, every living creature, and you and I. We were created for His glory (Isaiah 43:7). At the crescendo of creation, after all the beauty of earth and space were made, God made man in His image. (Gen. 1:27) He made us in His image, to bare His likeness. Out of all the amazing things that God created, He made us in His image. He chose to be in relationship with you and I. He chose to bring us into His family and take us on this amazing, epic journey for all eternity. Knowing we’d be sinful, knowing about our darkest hours, He chose us to bring Him glory. God is sovereign over all things. He is the originator of all things. So He did not need us. But for some reason He chose us. He chose to be glorified through us and to allow Jesus to be glorified by rescuing us from sin and death. Jesus was the plan from the beginning of time. Sending Jesus to earth wasn’t an after thought – some kind of knee jerk reaction to the fall of man. Jesus was the thought! And all of creation, including our life, is caught up in the story of His glory. This section of scripture says it all…. WOW! He chose us, in Him, before the foundation of the earth, to glorify Him “according to the purpose of his will, 6 to the praise of his glorious grace”. So what now? What do we do with this life that He predestined for His glory? Do we have to be perfect and never have a weak moment so that we glorify God? No…. He is glorified even in our weakness. 2 Corinthians 12:9 (ESV) 9 But he said to me, “My grace is sufficient for you, for my power is made perfect in weakness.” Therefore I will boast all the more gladly of my weaknesses, so that the power of Christ may rest upon me. Even in our weakness God is glorified! It’s actually our weakness that brings Him the most glory. We are hopeless without Christ. Our works of the flesh are like filthy rags (Isaiah. 64:6). Our desperate dependence on Christ is what brings Him glory. So we can rest in Him, knowing that our sanctification is a process and that every good thing we do is only by His grace. We have to live our lives in constant fellowship with Him. Relying fully on His grace and strength. When we fail, we allow Him to pick us back up and restore us. We don’t have to be ashamed of our failures. We live them out publically and show the world how the love and strength of God has seen us through and lifted us up. And in that life of dependence on Christ, we live for His glory! We live out what we were created for. Just as the beauty of the Grand Canyon is vast and inspiring – let our lives and dependence on Christ be beautiful and inspiring. We were created for His glory! Previous Previous post: Wax on….Wax Off! Next Next post: Thanks For Entertaining Us?